Preheat oven to 200°C (400°F). 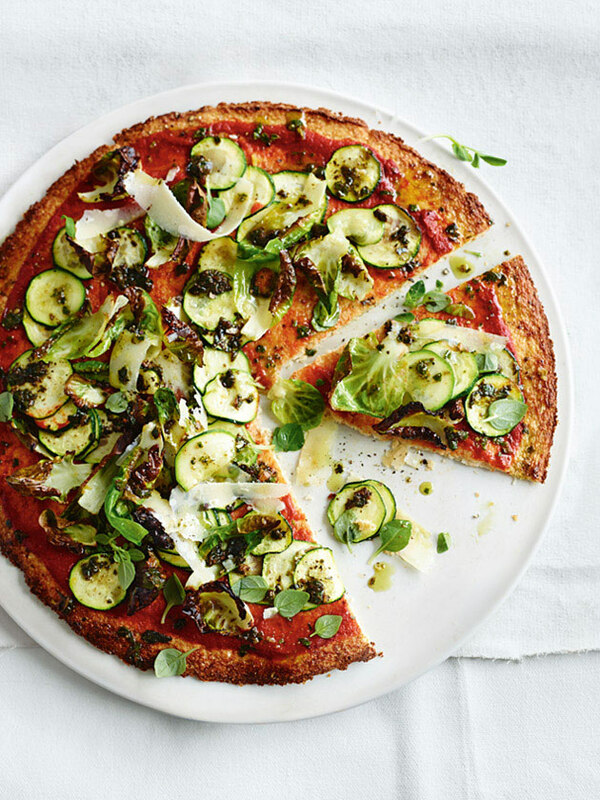 To make the pizza bases, place the cauliflower in a food processor, in batches, and pulse until it resembles fine crumbs. Transfer to a large bowl, add the almond meal, parmesan, eggs, salt and pepper and mix to combine. Divide the mixture in half and place each half on a lightly greased 30cm pizza tray lined with non-stick baking paper. Press out each piece of dough into a 30cm round and bake for 20–25 minutes or until golden and crisp. Place the zucchini, brussels sprouts, oil, lemon rind, salt and pepper in a bowl and toss to combine. Spread each base with the passata and top with the zucchini mixture. Bake for 5–10 minutes or until the vegetables are crisp. Top with the parmesan, pesto and baby basil to serve. Makes 2. + If you’d like to make your own pesto, try our kale and watercress pesto recipe, here.